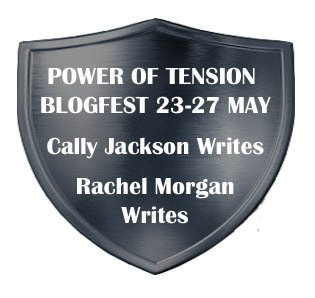 My friend Cally over at Cally Jackson Writes, has convinced me to enter the Power of Tension Blogfest that she and my friend Rachel over at Rachel Morgan Writes are running this week. It ends in about 10 minutes, so talk about squeaking in under the wire… there’s a bit of tension right there! Oren and Beck, 2 12-year-old boys, are running from the evil King Feridon and his army. They don’t know why he’s after them, but they know if he catches them they will, in all likelihood, be killed. Racing through Dreadwood, they become separated. Beck, with 50 soldiers behind him, struggles desperately to stay ahead of the war horses on his small farm pony…. Hating to ask for even more, Beck drove his heels into Cedric’s sides, urging him on again. The generous pony tried courageously but he had little left to give. His hooves pounded on relentlessly, but his chestnut coat was soaked with sweat and his breath came in great rhythmic gusts. His ears lay back against his head, not pinned tightly as in anger, but as if he hadn’t the energy left to prick them forward. In spite of his greathearted effort, as the ground before them rose again he began to slow. The change in pace was almost imperceptible at first, but as he battled the continued incline it became more noticeable, and Coulter and his swift bay gained inexorably on the laboring pony. Beck looked back. The bay was only a few horse-lengths behind. Hating himself, Beck reached back and slapped a hand across Cedric’s flank, hoping that deep down the pony had a reserve of energy, but Cedric’s pace didn’t change. Beck glanced back again and the bay was so close now he could see the crescent-shaped swirl of white hair on its forehead and the pink lining of its flaring nostrils. But the proximity of the bay horse, who was tiring, too, was not nearly so frightening to Beck as the grim expression of the man who rode him. That man, a total stranger who could not possibly have had anything personal against Beck, wore a mask of determination that made Beck shudder, as if his entire life depended on capturing a boy and a chestnut pony. So there you have it… I was limited to 300 words (there are 260 here.) Did I manage any tension, or … Hey! Wake up! I forgot to add no falling asleep to no throwing spitballs or laughing! Check out the other entrants here! I enjoyed this and feel really sorry for the pony! I think there is some good tension in here the pony not being able to gain speed and tiring, the guy behind him gaining fast and then the idea of getting caught by that guy and what it would mean. Yup. Pretty tense. Terror is always so much more real through the eyes of a child. The poor pony! I hope it made it! Hey, that was really great! Makes you wonder why they're being chased, and what's going to happen next! The description of the pony's efforts was very well written! Grace – Thanks, and I'm glad it drew you in! Plenty of tension here, Susanna. The chase, the uphill struggle, the uncertainty about the outcome…good work. Wonderful job! I was completely drawn in. Thanks for all your nice comments everyone. I'm glad you all enjoyed it! Absolutely – great tension here! I was right there in the moment with Beck and that poor horse – well done! That was wonderful – dripping in tension, beautiful lyricism, great characterization. I would definitely read more! The poor pony. I worried about him. That was a lot of struggling tension for two 12-year olds. Great job! I'd like to follow you, but your list has also disappeared! Susan, Vicki, Kittie, Amy – thanks so much! Kittie – I don't know where my list went! I've had a few problems with blogger the past week or so, but this is a new one. Please check back – hopefully it will reappear! Now that was tense, and I'm hooked. Loved it. Glad you got it in under the wire. It was a great entry and excellent example of some tension. Great job. Poor Beck and Cedric, but great tension. I have an awful feeling there will be a scene in this novel similar to the saddest scene in Neverending Story. That would break my heart. The only thing I was a little confused about was that Beck knew the name of the man riding the bay but then that man was stranger. Of course, I realize he could still know the name of a stranger, so that's probably more about not having read the beginning of the novel. I'm awake, promise!!! The poor pony… And I feel bad for Beck because I know he didn't want to push the horse so hard. I'm already strongly disliking the guy chasing them. Well done!! Good job. I want to know more about the man on the horse definitely! Great stuff. I can feel myself wanting to urge them on as the man and the horse gain ground. I especially liked this line: “…the bay was so close now he could see the crescent-shaped swirl of white hair on its forehead and the pink lining of its flaring nostrils.” Superb visual! Ellie – thanks, I'm glad you liked it! Julie – I'm totally the same about animals! Stickynotes – oh good! glad you were on edge! Libby – he's an interesting guy, actually….